We the SD9 in for a weekend before our SD8 arrived and several people have asked my impressions of it. I’ll tell you what I think of it in a minute, but first let’s go over some specs. The SD9 is the smallest (currently) in the newer SD line from DIGiCo. The naming structure may be a bit backward; the SD7 is the big daddy, while the SD8 fills the middle ground. On the other hand, they’re in chronological order, so I guess it makes sense. The SD9 is capable of handling 40 input channels. That doesn’t seem like a lot until you read closer and discover that, just like it’s bigger brothers, each of those channels can be mono or stereo. So while it’s not the same as having 80 discreet channels, you can put 80 inputs into it. More than likely, what you’ll find is that having stereo channels anywhere on the board is a huge convenience. 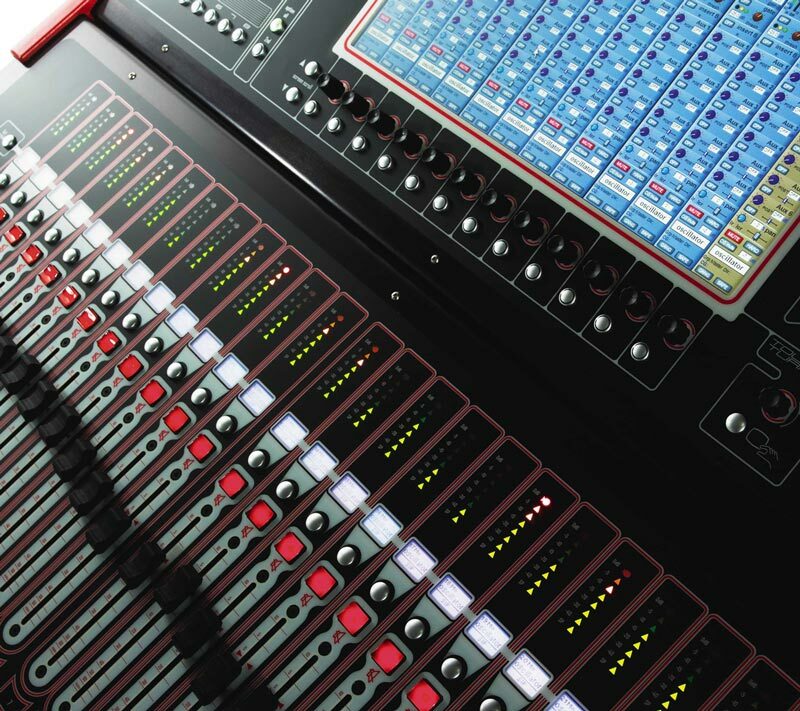 For inputs like piano, keys, video, iTunes, or CD, it’s nice to not tie up two channels-and more importantly on smaller-footprint boards-two faders. For the small to mid-sized church, this input count is probably sufficient. On the output side of things, the SD9 follows in the footsteps of the SD7 and SD8, albeit on a smaller scale. There are a total of 17 groups or aux buses available, each of which can be mono or stereo; how you allocate them is up to you. For example, you could have 16 stereo aux mixes and 1 stereo group (you have to have at least 1 stereo group for main outputs); or 6 mono aux mixes, 6 stereo aux mixes, 2 mono groups and 3 stereo groups; or...well you get the idea. While it seems confusing at first, to me, it’s one of the best features of the console. You can configure it how you need it—which might be different from how I need it. With the SD9, you’re not locked into a fixed architecture. Reconfiguring the console takes just a few moments, and you’re ready to mix. You also have an 8x8 output matrix, the inputs of which can be anything; a group, an aux or a channel. Again, flexibility is the watchword here. The standard SD9 configuration comes with a 32x8 rack; a new model called the D-Rack. Rather than connecting via MADI, it uses a single CAT5. There is an extra output slot on the rack, which can be filled with analog or AES outputs. It’s possible to combine two D-Racks using only CAT5, and using the MADI input on the console a MADI- or DIGI-Rack can also be connected making the pool of inputs an impressive 132. If you were mixing multiple bands at a festival, you could easily swap between inputs using snapshots, reloading shows, or even using the alternate inputs available on each channel strip. It’s also possible to connect using fiber. The surface of the console is quite small—not even 3 feet wide—and much of that is taken up with the 15” wide touchscreen LCD monitor built right in. There are 24 faders, each with it’s own multi-color 3-line LCD scribble strip and 8-segment input meter. The faders are arranged in two banks of 12, and each bank has four layers. Like the SD7 and SD8, each fader is completely assignable. It’s very easy to build banks of input channels, groups, auxes and matrix faders on one bank. Like the bus structure, you lay it out the way you want it. Whereas the SD8 has 3 rows of assignable encoders above each fader, the SD9 has a single row under the monitor. The monitor displays channel strips for one fader bank at a time, something I’ve grown to love on the SD8 (seeing input gain, EQ, comp, gating and aux sends for 12 channels at once is incredibly useful). The encoders are assignable as a group to gain, lpf, hpf, comp, gate, aux and pan. When in aux mode, a set of scroll buttons select which aux is being controlled. While not as fast as the SD8, it is quite serviceable. One thing I didn’t like about the SD9 is that the monitor is centered over the fader banks, so there is never a time when the monitor channel strips line up with a bank of faders. Coming from the SD8, I found this somewhat confusing at first, however, after mixing on it for a weekend, my friend Kevin Sanchez reports it’s not bad once you’re used to it. Also provided is a VGA output on the surface for an overview display. I use that as a quick view of all my inputs and outputs on my SD8, and would do the same on the 9. Something DIGiCo has done better than almost any console manufacturer is make the software interface consistent throughout the SD line. In fact, were it not for the splash screen and bus/fader limitations, you’d be hard pressed to tell the three versions of software apart. All three boards share the same SFPGA Stealth Processing, there is just more or less of it available depending on the model. Because of bus structure limitations, it’s not currently possible to directly load an SD7 or SD8 show onto an SD9. However, I’m told they’re working on a “Load Partial” feature that will let you truncate the show to fit within the limitations of the console. Still, the good news with the shared processing and software is that the SD9 sounds just as good as it’s bigger siblings. You also have access to the same effects (in a rack of 4), the same fully parametric EQ (with up to 4 dynamic EQs), built-in compression (with up to 4 multi-band comps available anywhere) and dual insert points on any channel. It should be noted that every input, group, aux, matrix and even the talkback channel has all these features available. Of course, you also get niceties such as the excellent snapshot system, the macro commands, touch-sensitive faders, dual solo busses and an interface that just screams, “Remote control me with an iPad!” In other words, it’s a lot like the SD-8, only smaller. What’s really impressive is that you have 2/3s the input and bus capability, 3/4 the matrix with a significantly smaller footprint, all for about 1/2 the price of the SD8. A standard SD-9 with a 32x8 D-Rack lists for about $27,000. Add a second, redundant power supply for another $2,000. Yes, the SD9 is a little more expensive than an M7 or an SC-48. However, with the super-flexible bus and surface structure, and arguably better sound, I think it’s a good value. In the end, it comes down to what is important to you. If I were spec’ing a church install with a console budget of $25K today, I would certainly have the SD9 on my list of boards to consider. Having spent considerable time on the M7, and in the Avid software (though not nearly as much on the surfaces), I would find myself leaning toward the SD9. I have already become spoiled by the flexible bus structure, stereo channels, the surface configuration and the sound of the DIGiCo consoles. In just a few short weeks, I’ve become completely at home on the SD8. Going to the SD9 was not a big leap, and only required a few changes in workflow. For a volunteer sound team, deciding between an SD9 and an M7 will come down to what you value. If having every fader on the surface is of the utmost importance (because the goal of the team is to simply manage volume), the M7 is a good choice. If you are mixing at a higher level, and your team understands EQ, compression, gating and the proper use of FX, I think the SD9 is quite a bit faster to get around. I also greatly prefer the SD9’s show-based file system with snapshots compared to the M7’s scene-based arrangement. Arguably, the SD9 takes a bit more time to set up, configure and get ready to mix. Once you spend that time with it however, it’s an absolute joy. DIGiCo has been very good about releasing software updates with fixes and enhancements, and I expect the SD9 to continue to grow and develop as time goes on. It’s certainly one you should consider if you’re in the market for a mid-priced digital console.